A folding bike and work station, which can be used as a desk top work platform for your laptop, favorite book, iPad, Smartphone and any device of your choosing. With a fully adjustable sliding desktop, folding design and transport wheels, you have never found such a compact and ergonomic work-exercise machine. There are 5 height adjustments, holding a maximum weight of 44 lbs. It also features 2 cup holders, storage drawer and a soft foam durable arm rest. It is easily foldable for storage, and can fold up when fully assembled with a foot print. Adjustable seat fit 5’2” to 6’3” user height. The Airsoft seat is large and oversized (11″ L X 15″ W), using aerodynamic healthcare technology allowing air to breathe through the fabric. The seat remains cool after many hours of use. 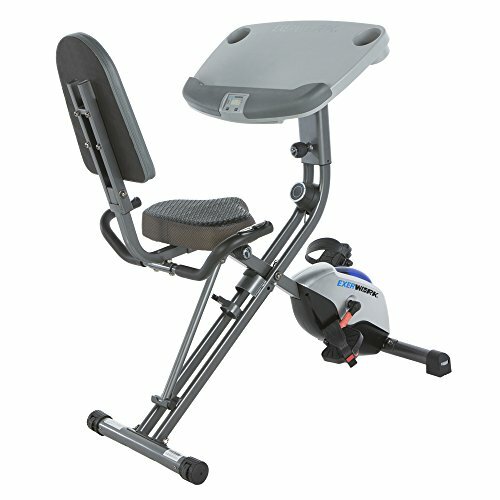 It has a cushioned backrest, built-in hand-pulse sensors that monitor your heartrate, and LCD computer screen, you will cycle your way to physical fitness and productivity in no time! Not recommended for people less than 5’3”, as it can make it difficult to get off the bike. Take a mat to protect your natural wooden floor from the desk station bike. 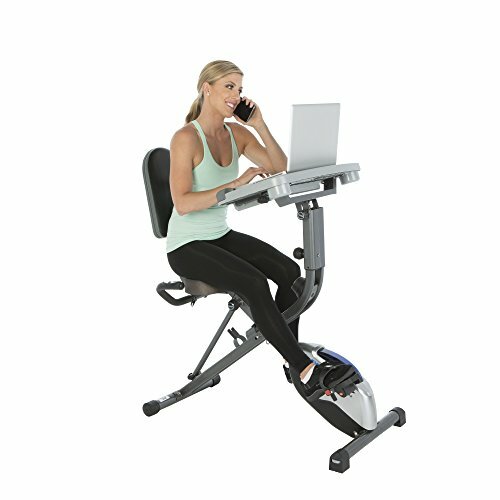 Pedal your way to productivity now!